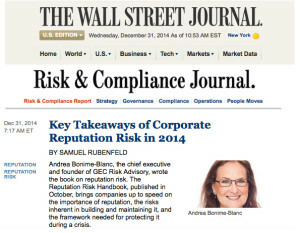 Rosenzweig & Company Advisor Andrea Bonime-Blanc was Featured by The Wall Street Journal about "Key Takeaways of Corporate Reputation Risk in 2014" By Samuel Rubenfeld, reporter for the WSJ's Risk and Compliance Journal. Many decades of experts and managers have dealt with the issue of reputation, and they've dealt with it from a public relations, public affairs or branding standpoint. But very few have dealt with the issue of “reputational risk.” Only in the last few years have we seen the words used together. There have been some very interesting surveys and studies done by the Big Four showing that boards and C-Suites are very concerned about reputation risk, not just management. There hasn't been much done on it. It’s been a hot topic for the last couple years, not just in 2014, because people are now talking about it, and more boards are concerned about it. They may not have the tools to deal with it, and the issue may be affecting them personally. Boards and C-Suites are more in the cross hairs of investors, shareholders and other stakeholders. They’re viewing this as not just an organizational risk issue, but also as a personal reputational risk issue. 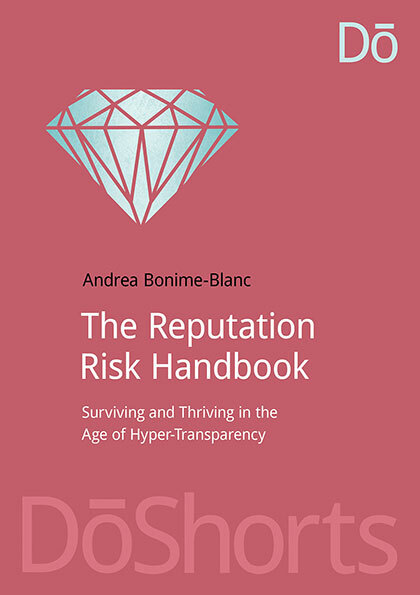 I started writing about reputation risk in my column, and it was through those columns that a publisher approached me to write the book. I think General Motors Co. is probably up there. They projected 13 deaths when they revealed the scandal earlier this year, and the lawyer has now said there’s 42 deaths associated with the ignition switch. The investigation revealed deep-seated cultural issues, revealing reputation risk’s association with corporate culture. Another big scandal is the Tesco PLC accounting fraud case. The Takata Corp. airbag scandal is a big one as well, because it reinforces a lot of problems in the auto sector. The South Korean ferry boat capsizing early this year was a terrible health-and-safety related reputation scandal. Wal-Mart Stores Inc. has ongoing issues in their bribery scandal, but they’re working and responding to it. Of course, all the cyber issues, including the Sony scandal over “The Interview.” They’re trying to fix earlier missteps: They’re finding ways to address it and make it a win for them, and they’re learning as they go along about reputation risk, along with cyber risk. Siemens AG handled itself well in the brewing Brazilian international construction corruption case. Here is why: The company created a strong internal anti-corruption program [ed note: After its 2008 bribery settlement] that includes effective internal audits. Its program resulted in their not only finding this instance of corruption in Brazil, but they also stepped forward and voluntarily revealed this information to Brazilian authorities, and they’re cooperating in the ongoing investigation. This reveals a company that has created the internal programs necessary to manage not only the underlying risk – corruption — but also the reputation risk associated with that underlying risk. A critical aspect of effective reputation risk management is that it not only helps to protect reputation from negative events and crises but it may actually help enhance and build value over time for an organization that takes this issue and these programs seriously.